While a printer tends to be given away as standard with a computer (and are easily picked up for next to nothing), it's the ink cartridges that rack up the costs. 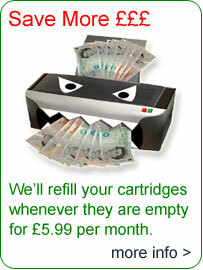 In many cases the cost of the cartridges outweighs the printer itself. Thankfully, with Planet Ink Club, this cost is a thing of the past, but how do you go about actually getting the cartridges in and out of your printer? Remember that each tends to be slightly different to reflect the manufacturer of the printer. Consequently, changing the ink cartridges is slightly different for each printer. Regardless of the model of printer you will need to get to the inside of the printer to change the ink cartridges. There are usually four cartridges to change: black, magenta, cyan and yellow. To find the cartridges the easiest way is to open the top of the printer and look for a black box. In most cases the four colour cartridges should be visible in their respective colours within the box. If they are hidden somewhat you may have to look for a button (usually with a catridge pictured on it) to release the cartridge. Hold this down for a few seconds and then this should move the black box out into the open. Sometimes a lever may need to be depressed to release the cartridge. A fore finger and thumb should remove the ink cartridges from the box. There will be some resistance. Examine the inside of the box that held the ink cartridges. Chances are there will be some ink residue. Use a non-linting cloth to clean it up out of the box. This could clog the ports for the next set of new cartridges. Each colour should go into the same colour slot it came out of. Place them in heel to toe, which should cause them to click to signify they are in place. Make sure everything is closed up and in place. Turn on your printer and it should do the rest!